Text: A fairly satisfactory proof that the cinematograph has conquered is to be found in its popularity, not only in the ordinary music-hall, but among less enlightened audiences even than those which one finds there. At Barnet Fair, this year, I noticed that many of the old shows had given place to animated pictures, and at the Fête of the Invalides in Paris, a few weeks later, I observed the same development. In both cases the invented story, comic, tragic, pathetic, was the staple; there were no royal processions, no conferments of the freedom of cities, no military manoeuvres. Instead of taking the place of the illustrated paper, as the cinematograph did almost exclusively, and still does at the more pretentious halls, it was taking the place of the theatre. 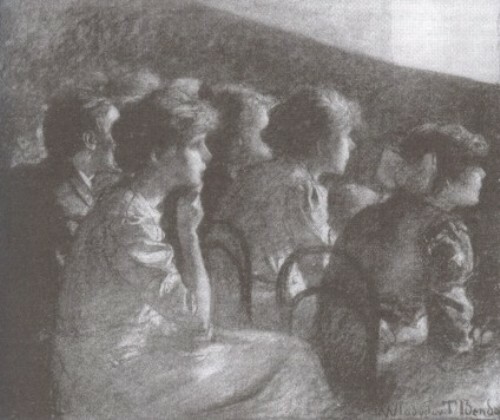 And for two very good reasons it was making the real theatrical booths look very foolish – one being that the pictured stories were bright and engrossing, involving the use of only one sense and never straining that (whereas a stage play in a booth one often fails to hear and sometimes to see at all); and the other that the body of the booth was in darkness, a favourable condition for those who attend fairs in couples, whether in England or France. Comments: Edward Verrall Lucas (1868-1938) was a British essayist with an opinion on many things. I have not been able to trace the original source of this quotation, which McKechnie dates as 1906. This entry was posted in 1900s, Essays, United Kingdom and tagged Dark, E.V. Lucas, Fairgrounds. Bookmark the permalink.